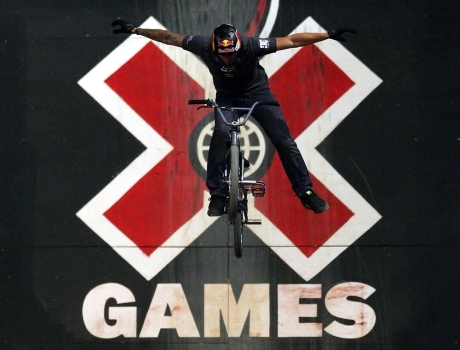 The X Games have become a popular sporting event focused on action sports. It has found popularity and big money sponsorships by fulfilling a niche in extreme sports. The event is particularly popular amongst the under-forty crowd, a highly prized demographic for advertisers. This has made the X Games a popular and trendy event featuring top tier athletes and a winter and summer edition. It is shown on ABC and ESPN. The electric atmosphere is filled with excitement and a youthful, rebellious attitude. It’s a mixture of sports, music, and celebrity that only continues to grow in popularity. This event, in particular, has given skateboarders a chance to shine, and be exposed to a much larger audience on a national level. The X Games has helped legitimize the sport, and pumped sponsorship money into the pockets of the participants. One skater who won first place last year at the skateboard street event was Paul Rodriguez. He’s an American skater who competed against the crème de la crème of street skaters and managed to wow the judges. He put on display his technical portfolio with such tricks as the front-slide, blunt-side, and a switch 360. He was able to put on one of the best X Game performances. Another skater who put on an impressive performance was Bucky Laseck. Another American skater, he emerged the winner of the Skateboard vert final, winning the gold medal. In Barcelona, Spain he put on a spectacular performance, competing against skaters from around the world for a coveted X Games medal. At forty years of age, Bucky Laseck proved that you don’t have to be young to be a top-level skater. However, Brazil also proved in the same year to produce skaters who could compete on the world-level. Brazilian skater Pedro Barros won the gold, competing against other concrete park riders, including American skaters. Currently residing in Florida, Pedro Barras is astonishingly only seventeen years old and has already won many awards. He skates on a daily basis in his backyard, where he has a vert ramp and a pool. And, of course, Tony Hawk has to be mentioned, for performing the 900 for the very first time at the X Games. In 1999 Tony Hawk managed to land the 900 after many failed attempts. Performing this trick at the X Games helped catapult Tony Hawk into the major media star that he is today. The 900 is an aerial spin performed off a skating ramp, where a skater has to make two-and-a-half aerial turns. Only the most elite of skateboarders can pull off this trick, and many great skaters have tried and failed to pull off this move. The popularity of the X Games has even spawned a video game called ESPN X Games Skateboarding. Players can compete in either vert or street versions. This is proof of how skaters’ spectacular performances at the X Games have even inspired the creation of video games. 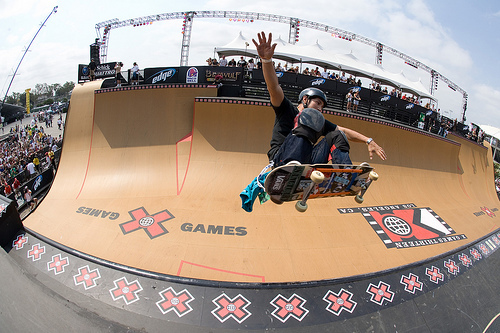 The X Games also gives young people from all around the world a goal to aspire to when vert or street skating. The X Games is like the Olympics for skateboarders. Kellie Swaim is a skateboarding eficionado by work for Kryptonics, makers of quality skateboards and skateboard wheels. Learn more about Kellie by following her on Twitter. This entry was posted in Featured, Festivals and Events, Land Sports, News, Skateboarding and tagged Skateboarders, Skateboarding, X Games. Bookmark the permalink.